The Absorbent Round Sandstone Coasters are 100% Natural sandstone and are great for corporate events, client gifts, wineries, restaurants, hotels and souvenir shops. Each cut from natural slabs of sandstone, every coaster has unique natural patterns and variations. Your customized 4-color process design is printed directly onto the stone for a permanent and durable imprint. 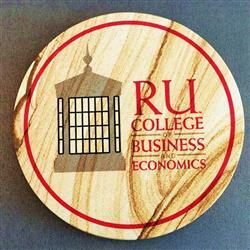 Customize these great coasters with your promotional logo to let these coasters do more than just protect your table. Production Times Available: 10 working days standard. 7oz per coaster. Absorbent Natural Sandstone. Round Coasters.